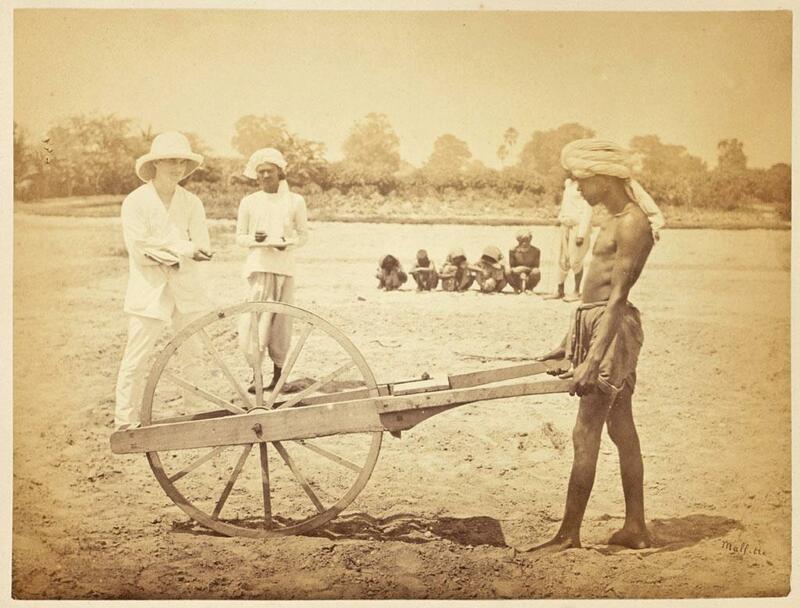 It is a tragedy that the agrarian situation in the country doesn’t seem to have changed much even after a century. The plight of indigo farmers in Champaran a hundred years ago is the plight of farmers all over the country in modern-day India. 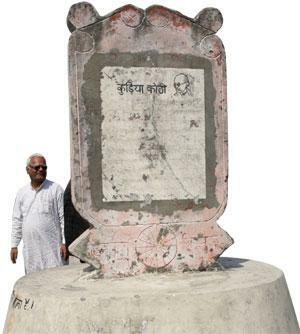 The Champaran movement, or Neel Satyagraha as it was popularly called, was a symbol of the fight for ethics and rights. There was a clear exploitation of the poorest of the poor and the motive was unbridled profiteering. It became a very emotive issue because on one side were rich landlords backed by the most powerful empire of the time, while on the other side was a completely disenfranchised and enslaved community—that of the subsistence farmer. It was assumed that they did not have any voice or pose any threat. Terms like common market and world community that are used today were, in certain ways, also present at that time. Then, as it is now, the philosophy was to extract raw materials at the cheapest rate and to find markets to sell them at most remunerating prices. The trade was loaded in favour of the manufacturer, while the seller of the raw material as well as the purchaser of the finished product were the sufferers. The mills of Manchester were thriving because of the dye that was being produced by farmers in India, who were made to produce it compulsorily. But once the colonisers got cheaper synthetic substitutes, the farmers were abandoned. The situation is similar to what cotton farmers of Vidarbha have faced in recent years. At one time, textile mills used cotton produced by Vidarbha farmers, but now they have shifted to synthetic yarn produced by petrochemicals giants. This is unfortunate because at a time when people are trying to move towards natural, organic and eco-friendly products, we have abandoned our traditional expertise. 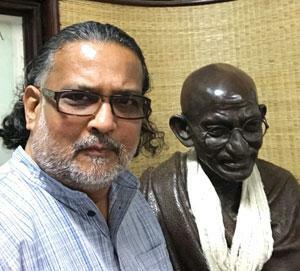 So today again, both commercially and as a symbol of justice, the Neel Satyagraha is relevant. But organising a satyagraha today is more difficult than it was under the British. At that time, it was a fight against an alien rule. Now we have to fight our fellow citizens or our own government. We are also divided by our political loyalties. Unfortunately, none of the movements, even farmers’ movements, have been able to stay completely clear of political overtones. As soon as political overtones emerge, movements lose steam. A satyagraha today would have to focus on farmers’ suicide. The farmers who killed themselves to escape their reality were really strong, but we have to ensure that their children, widows and parents do not become seeds of future conflicts and seek revenge. Mahatma Gandhi chose to fight for farmers because he realised that we were an agrarian culture and what affected farmers would affect the entire society. Otherwise he could have picked many other issues. When he arrived in India from South Africa, the intellectual debate on home rule and freedom was urban-centric. But the Neel Satyagraha galvanised the whole nation and became a symbol of resistance. Even today, there is a worldwide concern for the widening gap between the rich and the poor and the conflict this is bound to create in future. So Champaran becomes a very powerful symbol of the fight to provide justice to the poor. If one looks at the Neel Satyagraha only as a movement for the rights of indigo farmers, one may say that it has lost pertinence. But as a movement for the empowerment of the downtrodden, it remains relevant. I have never been to the Champaran region, but I have heard that travelling there feels like time travel. That’s how backward the place is. And there are so many places in India for which this holds true. Notwithstanding the centenary celebrations of the Neel Satyagraha in Champaran, the epicentre of the first satyagraha undertaken by Mahatma Gandhi in the country, another similar movement is brewing in the region. The protagonist is the same—landless farmers struggling to reclaim land that supposedly belonged to their ancestors. When the British were leaving the country, the land they had taken from kings and peasants to undertake captive farming of indigo was to soon become worthless to them. To profit from it one last time, they sold around 40,500 hectares (ha) in Champaran (now comprising East Champaran and West Champaran districts) to industrialists and landlords. Around 16,100 ha was bought by sugar mills. Post Independence, the state government passed the Bihar Land Reform (Fixation of Ceiling & Acquisition of Surplus Land) Act, 1961, which put a limit on land one could own. The Act divided land in different categories on the basis of its quality and set separate ownership limits for each. The excess land was to be distributed among landless farmers after 1971—the deadline for marking out land and the allottees. “This was done, but only on paper. 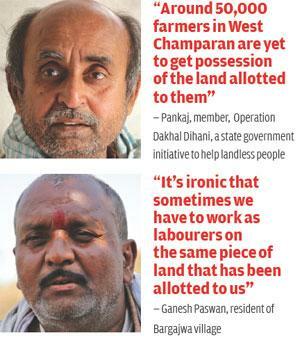 A large number of farmers never got possession because landowners would take the matter to court where it would drag for decades,” says Pankaj, a 70-year-old Gandhian in West Champaran district. “The current protests are in response to this denial of justice. 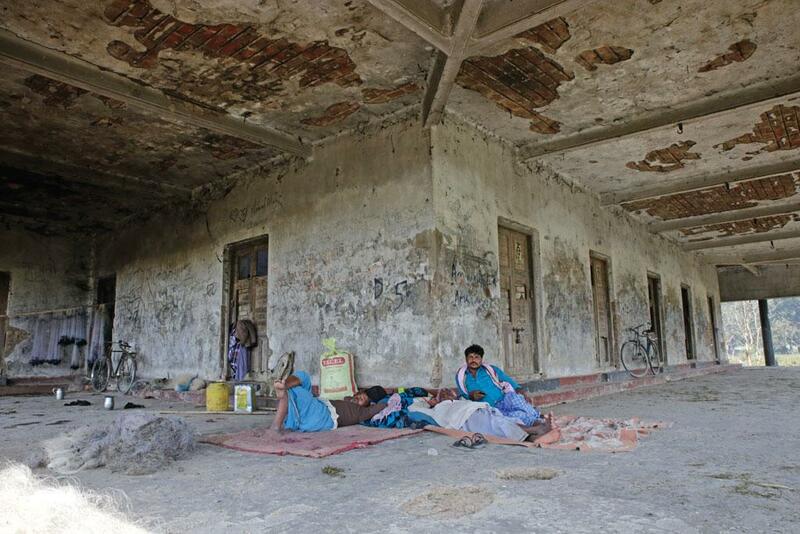 In West Champaran, nearly 55,500 ha is under illegal possession of landlords, industrialists and mills,” he adds. According to the Bihar department of revenue, the state has around 1.7 million parchadharis or people who have been allotted land under the Act, while the figure for West Champaran is 0.16 million. The department claims that only 12,000 people in West Champaran are yet to get possession, but Pankaj puts the number at 50,000. A total of 42 cases pertaining to land are pending in the Betiah district court. Harinagar Sugar Mill in West Champaran, for instance, owns around 2,104 ha. Of this, 2,023 ha should have been under the possession of farmers. 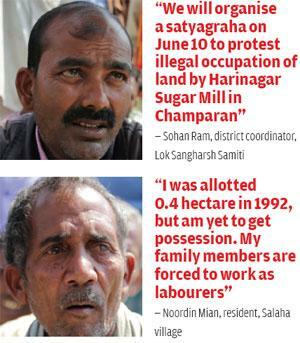 “We will organise a satyagraha at Harinagar Sugar Mill on June 10,” says Sohan Ram, coordinator of Lok Sangharsh Samiti, a Champaran-based non-profit formed in 2002 to fight for landless farmers. “The protest will be completely non-violent and we have already informed government officials concerned,” he adds. The non-profit has over 3,000 registered members who have signed a five-point declaration of adhering to non-violent means of struggle. The members are also aggrieved parties. Lok Sangharsh Samiti has organised seven satyagrahas since 2008 and has decided to keep 2017 as the deadline to resolve the matter. They say that satyagrahas have immensely helped their fight on an issue that was in limbo for the past 40 years. In the satyagraha, these farmers march to a designated farmland with the tricolour and sow seeds to claim ownership. Sohan Ram shares his experience of a satyagraha in his village Salaha in West Champaran in 2015. After informing all the parties, including the chief minister’s office, more than 100 farmers cultivated rice on over 20 ha owned by Dhruveshwar Singh. When the harvesting season arrived, the government imposed Section 144 to prevent the protesters from harvesting. But they did. Following this a case was filed against 19 people and they were jailed for four months. A total of 167 ha owned by Singh has been distributed to the village residents but they are yet to take control because the matter is in court since 1992. Noordin Mian, resident of Salaha and one of the participants at the satyagraha, says he was allotted 0.4 ha in 1991-92 but is still fighting to get control of the land. There are nine members in his family and working as a labourer is their only option. Similar is the case of Vishnu Ram, a 75-year-old farmer. He says he was allotted 0.3 ha in 2002 and is yet to get possession. He has been attending proceedings at Bagaha court, 40 km from his village, every month. “It is difficult to attend court when you are earning your living as a labourer,” he says. The Salaha satyagraha gained a lot of publicity in the state and more people joined the movement. In their next meeting held at Lauria village in February this year, over 5,000 people participated. “We never expected such a crowd,” says Pankaj. The landowners have protracted the case using all means at their disposal. Not only have they contested the case from district-level courts to the Supreme Court, they have also used a special law that was framed to help the poor. As per clause 45B of the Bihar Land Reform (Fixation of Ceiling & Acquisition of Surplus Land) Act, 1961, the litigants can approach the Bihar revenue department for grievance redressal even if they lose the case in the Supreme Court. The clause was framed because the government expected farmers to lose court cases. But not a single farmer across the state has used the clause; instead 21 landowners from West Champaran used it after they lost cases in the Supreme Court, says Pankaj. The landowners’ cases were so weak that just two officials of the revenue department resolved 38 cases in 45 days—all in favour of farmers, he adds. The Bihar government deleted this clause in September last year. The farmers are more hopeful now, particularly after Bihar Chief Minister Nitish Kumar assured them that his government would take concrete steps to resolve the situation. In March this year, the chief minister’s office invited Pankaj to discuss the centenary celebration of the Champaran Satyagraha. Pankaj says that he raised the issue of farmers’ struggle and the chief minister asked his officials to find a solution in a limited time-frame. Gandhi ji showed us the path of passive resistance and non-violence, and it is the best way to exhibit our strength, says Prakash, another Gandhian and retired professor in Betiah. The farmers will win this fight easily if they just continue to follow that path, he adds. A hundred years ago, indigo symbolised colonial oppression. Now it marks high-end fashion products. Though the natural blue dye never lost its sheen, its production in India under the British saw a tremendous decline after the development of synthetic indigo dye by German chemist Adolf von Baeyer in 1878. Farming of indigo was at its peak in the late 19th century. India produced nearly 19,000 tonnes of indigo in the 1850s and almost all of it was sent to Europe where the textile industry was experiencing a boom following the industrial revolution. The demand for natural indigo declined after German chemical company Badische Anilin und Sodafabrik started commercially producing synthetic indigo. Unlike natural indigo, whose colour depends on the climate of the area where the plant grows, the synthetic dye gave uniform results which were of benefit to the industry. By 1914, the production of natural indigo had reduced to 1,100 tonnes. The synthetic indigo still rules the market. But there is now a renewed demand for natural indigo worldwide as people are becoming more health-conscious. This has prompted farmers to once again embrace the blue gold. Its revival is particularly evident in Tamil Nadu, Andhra Pradesh and Karnataka, where hot and humid climate is conducive to the crop. In fact, during the Colonial period the kurpah (Cuddapah) indigo grown in the Madras region was quite popular in the international market because of its high colour content. 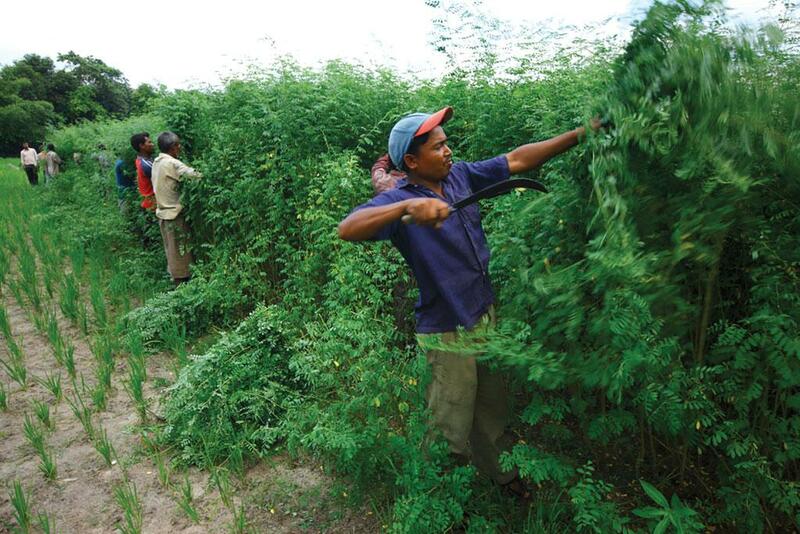 S Kamalnathan from Vellupuram district, Tamil Nadu, is one such farmer who shifted from moringa, a major cash crop, to indigo two years ago. He makes a profit of around Rs 2 lakh per season from his 3.6 ha farmland. “The leaves, which are processed to extract the dye, can be harvested two-three times a year. Besides, it requires less water and inputs,” says Kamalnathan. Indigo belongs to the leguminosae family of plants. Their root nodules fix atmospheric nitrogen in the soil and thus do not require nitrogenous fertilisers. After the initial profits, Kamalnathan now plans to take 16.4 ha on lease so that he can grow indigo on a large scale. In the absence of any official figures—the government has little information about indigo despite the fact that the cash crop has been cultivated and used in India for 4,000 years and 16 indigo species are endemic to the country—Kamalnathan says thousands of farmers in Vellupuram have shifted to indigo from other major cash and food crops in the past five years, and that the state produces 300-500 tonnes of indigo a year. However, he says, procuring good quality seeds remains a concern as the crop is neither grown by many nor promoted by the government. Most indigo farmers in Vellupuram procure the seeds from Andhra Pradesh, where the crop is witnessing a revival of sorts. The enthusiasm around indigo is spurred by the fact that the farmers do not have to make an extra effort to sell the produce. 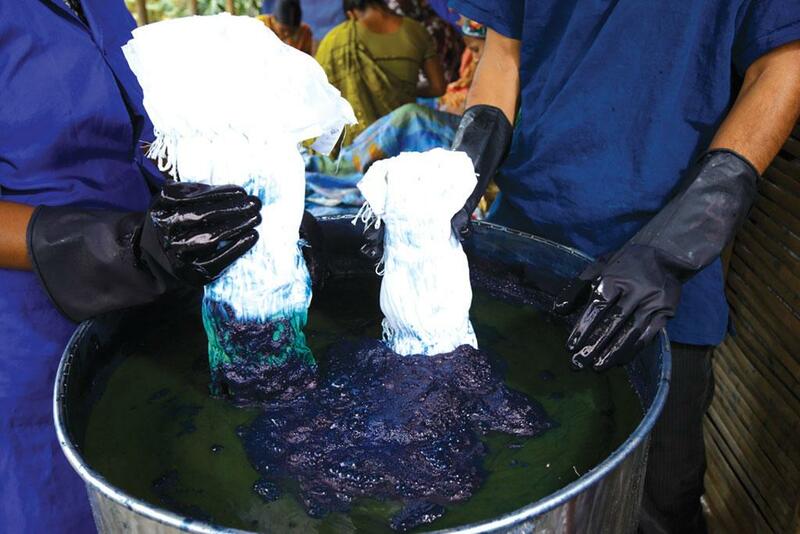 “Almost 70 per cent of our produce is bought by textile designers in Delhi and Hyderabad, and the remaining are procured by traders who supply indigo to Rajasthan and Gujarat, the traditional dyeing centres of the country,” says Kamalnathan. Shiv Keshav Rao, co-founder of Hyderabad-based design studio Creative Bee, is one such designer. His studio works with nearly 400 handloom weavers of Andhra Pradesh and Telangana and produces 2,000 metres of textile dyed or printed with natural indigo. Rao, who exports 50 per cent of the fabric, says demand for such products has doubled in the last decade. “It is a class symbol. People conscious of their status buy the fabric where natural indigo is used,” he says. Chippa Yaseen, a block-printing artisan from Pipar city in Jodhpur, Rajasthan, says the demand is so high that they cannot meet it despite working round-the-clock. Yaseen’s family has been doing indigo printing for generations. “There was a time when 105 families in Pipar were engaged in block-printing. But synthetic indigo forced them to quit the business,” he says. Yaseen could continue in the business because of a chance meeting with people from Fabindia, a chain store retailing garments. Today, he receives orders for hand-block printed and natural-dyed dupatta, sari and fabrics not only from India but from countries like Japan. M Sanjappa, an indigo expert who was former head of the Botanical Society of India, says the demand for natural indigo products has particularly increased in the past five years. This is because people have become more health-conscious and want to use natural products. Some non-profits working with farmers and artisans are also spreading awareness about indigo through seminars and workshops, he adds. There has been an amazing revival of indigo all over the world, says Jenny Balfour-Paul, an indigo researcher and author of Indigo: Egyptian Mummies to Blue Jeans and Indigo in the Arab World. “This is majorly because the younger generation is more aware of environmental concerns. They will have fewer clothes but of better quality and made using sustainable products. Natural indigo is the perfect sustainable product as it can be grown along with rice. Farmers also use it as green manure,” she says, adding that the surge in indigo farming is being witnessed in Bangladesh, El Salvador, the Caribbean and the US. The revival is particularly interesting in Bangladesh, where indigo has been a symbol of pain and struggle for thousands of farmers during the Colonial period and remained almost erased in people’s memory till the early 2000s probably for this reason. In 2004-05, Tushar Kumar, a Bangladesh-based textile designer, spotted some indigo plants while passing through Rangpur division and inquired about it. But no one could recognise the plant. Tushar managed to extract dye from the plants. “It motivated us and we decided to work with local farmers,” says Mishael ‘Mika’ Ahmad of Nijera Cottage and Village Industries (NCVI), a worker and artisan-owned social enterprise in Bangladesh. In 2008-09, NCVI worked with farmers of Rajendrapur in Rangpur Sadar upzila (sub-district) to grow indigo and is now helping them market the produce under the brand name “Living Blue”. 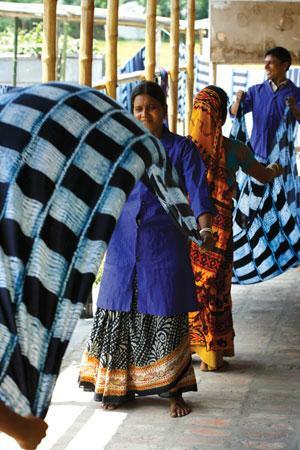 “The indigo we produce in Bangladesh has some magic, richness,” says Ahmad. Today, at least 3,000 farmers associated with NCVI are growing indigo. Most of them are landless. NCVI provides them land and seeds so that they get employment during monga—the lean period between two crop seasons. “There is a growing market for products prepared using natural indigo. But cost is a major hurdle. For instance, the denim prepared using synthetic indigo is much cheaper,” says Ahmad. Almost halfway across the world in Guatemala, indigo is making a comeback after a similar tumultuous past. The use of indigo is known in the country since the Maya civilisation, says Olga Reiche, a textile designer who has been promoting natural indigo for the past three decades. In fact, the Mayans are known to have used natural indigo to develop the Maya blue, a unique azure blue pigment. In the 16th century, when the Spaniards introduced the foot loom, women wove skirts using threads dyed with natural indigo. But natural indigo started losing its appeal across Central America with the introduction of synthetic dyes in the 1880s. Farmers again started growing the crop almost after a century. That was the time when organic farming, natural medicine and natural healing therapies were in vogue. "It is with the economic history of the industry that the story of the indigo disturbances must begin,” writes Ananda Bhattacharya, assistant director of West Bengal State Archives, in his 2012 book, Indigo Rebellion. His probe into the English newspapers of the late 1850s and other archival documents has brought forth the hitherto unknown pro-peasant attitude of both elite and middle-class Bengalis that had emerged in the undivided Bengal during the Blue Mutiny of 1859. In the autumn of 1859, localised acts of resistance by the peasantry against colonial economic policies turned into a general uprising in nine districts of Bengal. This set a precedent for other peasant movements like Champaran or the Bardoli Movement of 1928. "It is this indigo revolt in Bengal that inspired Gandhi to launch a movement against the tinkathia system (cultivate indigo on 3/20th of a land) in Champaran and establish a cult of non-violence,” says Bhattacharya. Unlike the Sepoy Mutiny of 1857, the indigo revolt integrated several classes of Bengali society. 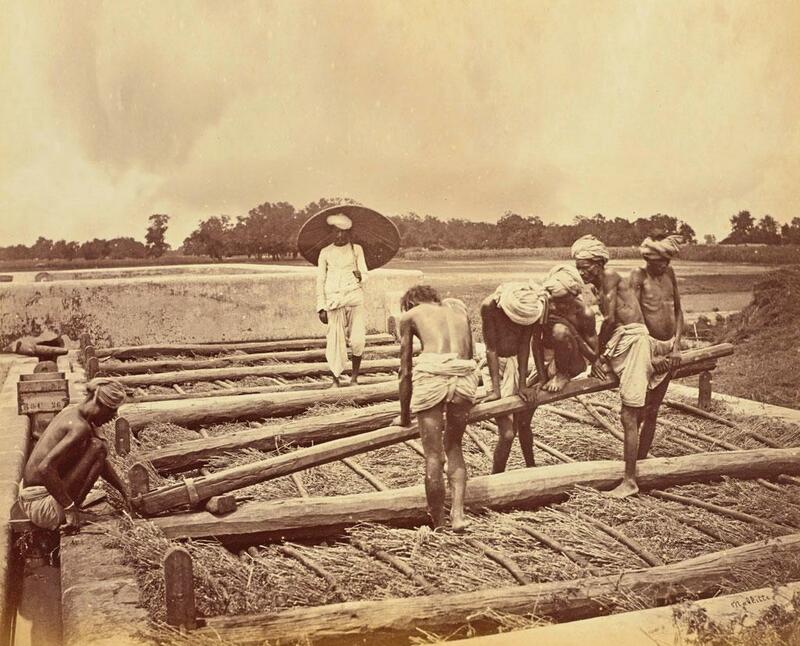 While Harish Chandra Mukherjee, in his newspaper, the Hindoo Patriot, condemned the indigo system in a series of editorials published between 1859 and 1862, landlords like Ramratan Roy and Bishnu Charan Biswas sided with the peasantry. Blair King, the American historian who looked at the rebellion from a sociological point of view in his 1966 book, The Blue Mutiny, observed that “for the first time, an Indian of the urban middle class was acting as a spokesman for the peasantry”. Dinabandhu Mitra was one such venerated spokesperson. His play, Neel Darpan, published in 1860, had an immediate impression on his contemporaries. 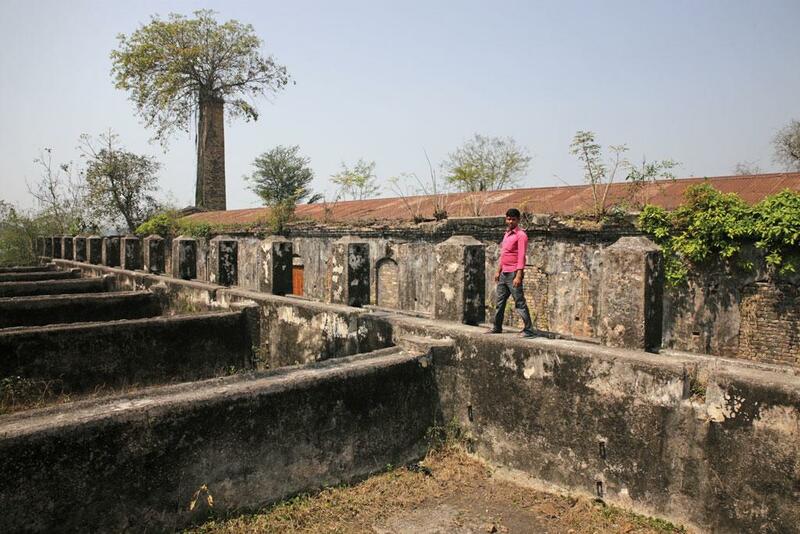 It reflected his first-hand experience of colonial despotism while he was working as a postmaster in Nadia—a major indigo-producing district in Bengal. Through his play, he wanted each Indigo planter to "erase the freckle of the stain of selfishness from his forehead, and, in its stead, place on it the sandal powder of beneficence." With the British forcing the peasants to grow indigo, the latter faced a constriction or denial of choice in crop selection, showed Mitra in Neel Darpan. This loss of status was irksome, wrote Sanjay Ghildiyal, a professor of history at Kumaun University, in an article published in the Economic and Political Weekly in 2010. Despite not having impressive literary and dramatic merits, how did this play by a not-too-well-known writer on a not-too-unfamiliar subject appear like "a comet on Bengal's social horizon"? In an article published in the Journal of Peasant Studies in 2008, Ranajit Guha, one of the most influential figures in postcolonial and subaltern studies, said that when the European planters started reacting to the play and decided to make it a cause for libel, the people of Bengal realised that the defence of Neel Darpan could be the defence of the peasantry. The play soon became a cause célèbre because it not only heralded dawn of political consciousness in rural Bengal but also demonstrated the heartless process of capital formation in Bengal based on exploitation of cash crop cultivation. 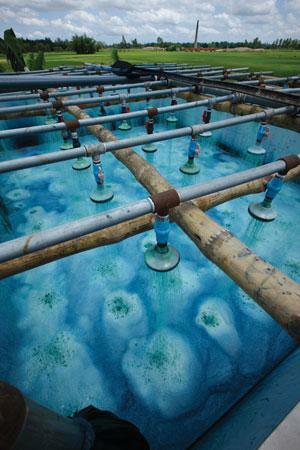 The episode turned the world’s only natural blue dye into a "terrible dye" in Bengal. Will BJP’s projected win help Vidarbha’s cause? "Farmer's income is more important than foodgrain production"
It is better not to create a fresh misery of marginal farmers living below subsistence level.on the indigo plantation too who will need bank loans w/o having the capacity to payback forcing the govt.for loan waiver.Organized corporate farming with the farmers as employee ensuring adequate income to make a living is a wiser option.